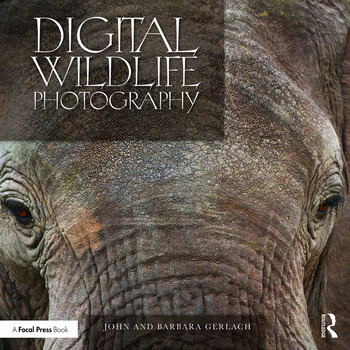 Using a combination of artistic approach and impeccable technique, professional photographers John and Barbara Gerlach guide you through the field as you photograph intriguing and captivating subjects out in the wild. Learn how to integrate equipment with technique to capture superb wildlife images of birds, mammals, amphibians, and more, with an emphasis on precision and speed. This book includes all of the details you need to capture wildlife photos easily and consistently – choose the right lens and best lighting while following simple composition guidelines that are perfect for wildlife. John and Barbara Gerlach have taken more than a million wildlife images since 1978 and run seminars and workshops all over the world. Their pictures have been published in Outdoor Photographer, Audubon, Popular Photography National Wildlife, Sierra, Natural History, Petersen’s Photographic, Ranger Rick, Birder’s World, as well as books published by National Geographic Society, Sierra Club and others.